Some of you may know that our twin baby boys, Aidan and Michael were born and died on the 17th of November 2002. As long as I live I will never forget the pain of losing them. It was indescribable. Twelve years later, I found the strength to write about our babies in my fiction novel Butterfly Barn. I gave this life changing loss to one of my lead characters, Jessie. My hope was that it would somehow shine a light on the deep and silent grief many of us live with. I am overwhelmed by how Jessie’s story has touched the hearts of so many people. One of those people is the owner of this little cutie. Who knew that Barney, the dog would lead us to a wonderful opportunity to highlight International Pregnancy & Infant Loss Awareness Week both in Northern Ireland and in the Republic of Ireland. 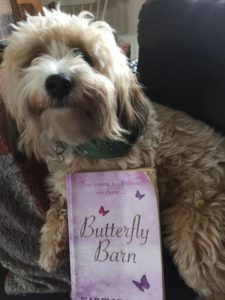 Jacqui Guy, Barney’s owner had left Butterfly Barn out for her daughter to read but Barney had other ideas and had a little chew. She posted this pic and we began to chat. When Jacqui discovered that I give talks in libraries nationwide about writing, publishing, learning difficulties and pregnancy loss. She told Steven, her husband who is the coordinator of an organisation called SANDS(Stillborn and Neonatal Death Society) in Northern Ireland. Steven had also read Butterfly Barn and they both felt that through Jessie I had really captured the feelings that surround this grief. So as part of International Pregnancy & Infant Loss Awareness Week, Steven has kindly invited my husband, Michael and I to Belfast where he has planned a ‘meet the author’ event but more importantly he has asked me to light the first candle at 7pm (GMT) for the International Wave of Light Ceremony on Saturday the 15th of October. 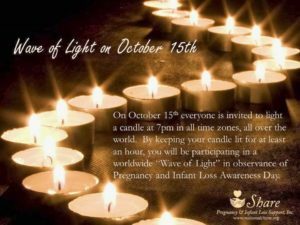 The hope is that for one hour a wave of light will travel across the globe in remembrance of all babies lost in pregnancy, stillbirth and infancy. Light a candle wherever you are in the world at 7pm. Share this simple beautiful idea with friends and relatives, you might not know it but you could be the light they need. We would be delighted to see pics of lighted candles posted to SANDS Facebook page, my Facebook page or to Feileacain, the association here in Ireland who help bereaved parents. You are not alone, just reach out. There are so many wonderful people in the world waiting to help. Over the coming days, I will share about all the fantastic things people are doing to highlight Pregnancy and Infant Loss Awareness Week. Proceeds from the online sales of Butterfly Barn and On Butterfly Wings from the 09th – 15th of October will go to both charities to provide Memory Boxes for bereaved parents to every hospital on the island of Ireland.